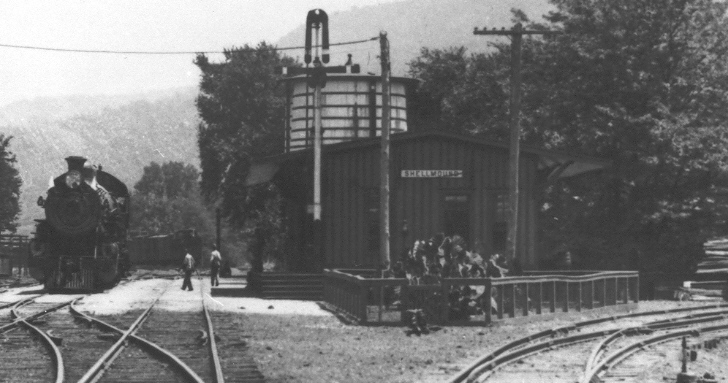 The Shellmound, Tennessee passenger depot sits in between two sets of tracks in this circa. 1920 photograph that was made by the Nashville, Chattanooga & St. Louis Railway photographer, H.C. Hill, Sr. The tracks on the left are the main-line of the N. C. & St. L. Rwy. while those on the right are a branch line leading to Cole City, Georgia about three miles away. Today, the land where this depot once stood is inundated by the backwaters of Nickajack Lake on the Tennessee River after the Tennessee Valley Authority completed Nickajack Dam in the mid-1960s. The main-line, which is today part of CSX Transportation Inc.'s system of railroads, is located farther inland from this location after it was relocated for the filling of the reservoir.